Some years ago I bought three hats at a bargain price. However, I only wore one, a practical wide brimmed straw one. I wore it when I was out walking on warm days and when my friend and I took our dogs for a run at the beach. I liked the look of the other two but lacked the confidence to wear them. A couple of years back I attended a one day WEA course about wearing your clothes with confidence. We were instructed to bring along an item of clothing we wanted to wear but were unsure about. I took along a black trilby. After the class I still didn't wear it. Then came a time when I no longer had a car. For practical reasons I started wearing a hat more often. If the weather was warm I wore a white fedora. Once I became comfortable with frequently wearing that I started wearing the trilby. These days I don't think twice about wearing it. A straw hat with a wide brim keeps the sun off your head and face. It is a must if you are at the beach or working in the garden on a warm day. I read a third of skin cancers are found on the face, neck and ears so wearing a wide brimmed hat is sensible. A minimum of 7.5cm (3 inches) brim is recommended to protect from the sun. When the sun is rising or setting it can sneak under a brim so a wider brim is recommended for these times for better protection. If the weather is windy a chin strap will help keep the hat on your head. At the other extreme, a fancy hat can add a finishing touch to a special dress bought to wear to the Melbourne Cup or similar event. I have never worn this type of hat or the type of dress it would go with. 1. 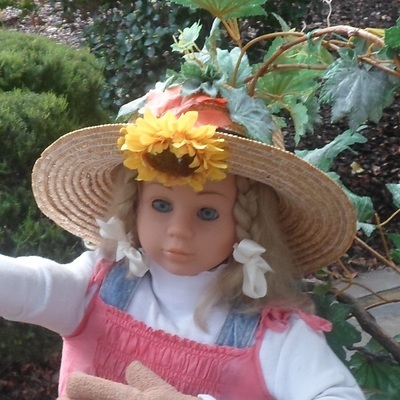 A woven hat can be worn with jeans and a plain white blouse. 2. A casual woven hat looks good with a sundress. 3. 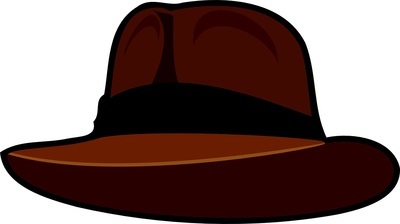 A dark brown fedora works well to stop an all black outfit from looking boring. 4. If you are wearing an outfit in one colour don't wear a hat of the same colour because it will look too 'matchy-matchy'. From reading a few fashion blogs I have learnt one doesn't wear shoes that match your bag these days as it is 'too matchy-matchy'. Apparently matchy matchy is bad. 5. Skinny jeans and a 'loose at the top' beanie team well. 6. 'Don't wear a beanie on the red carpet.' I had to add this quote as it doesn't apply to my lifestyle so it made me smile. 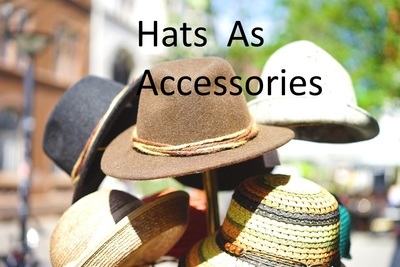 A hat can be practical and protect your head and face from the sun or keep your head warm in winter. It can add something to an outfit and be fun to wear. Hat maker and blogger Margo Nickel says,"Whenever you wear your hat, your day will be special."